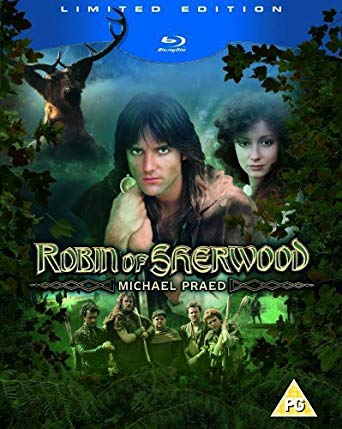 Before Prince of Thieves, before Men In Tights, before the more recent BBC adaptation, Richard Carpenter’s Robin of Sherwood was – at least, according to its fans – the first really compelling update of the legend. Spicing the hoary old stories up with hefty implications of supernatural and pagan goings-on beneath the surface, the series was a collaboration with HTV (the ITV provider for Wales and the west of England at the time) and Goldcrest Films; the latter was riding high in the mid-80s, thanks to the success of Chariots of Fire and Ghandi, and therefore the series was able to enjoy a budget that was a bit more expansive than your average ITV drama series of the time. For the first two seasons, the lead role was played by Michael Praed, whose Robin of Loxley is an Anglo-Saxon rebel against the established Norman order – a not uncommon take on the story. His tenure on the show was sufficiently successful that when he jumped ship for a Hollywood career, the producers not only swiftly recruited a replacement in the form of Jason Connery (Sean Connery’s son), swiftly cooking up a background story for Jason’s new character (Robert of Huntingdon) which allowed them to explore a different interpretation of the legend, they also extended the third season to thirteen episodes – as long as the first two seasons combined – in order to sell it to the American market. But at this point Goldcrest’s fortunes waned, with several commercial flops in a row forcing them to pull out of the project, leaving HTV with a high-budget show they couldn’t afford to finance themselves, and the series was cancelled. Now, after having been issued on a rather bare-bones DVD release (with a picture quality sufficiently bad I suspect they just mastered the DVDs from old VHS tapes rather than remastering the footage), the first two seasons of the show have come out on a rather gorgeous Blu-Ray set, making this the perfect time to ask the burning question: is the show any good?